In order to understand what Black Hat Seo is, you must first understand what SEO represents within any digital marketing strategy. The acronym SEO (Search Engine Optimization) refers to organic searches. Analyzing SEO is necessary to understand ​​how your digital marketing strategies are working. Thus, within these SEO strategies, you must consider aspects related to keywords, meta-description, structure (title, subtitles, alt in images, etc. ), internal and external links, etc. You must also weigh in the effectiveness of each of the techniques used in SEO. However, the analyzes you carry out will not guarantee your success. Today, online competition is so big that only a few will be able to find themselves at the top of Google’s ranking. The positioning in Google and the number of visits to their website has become an obsession for many of companies. 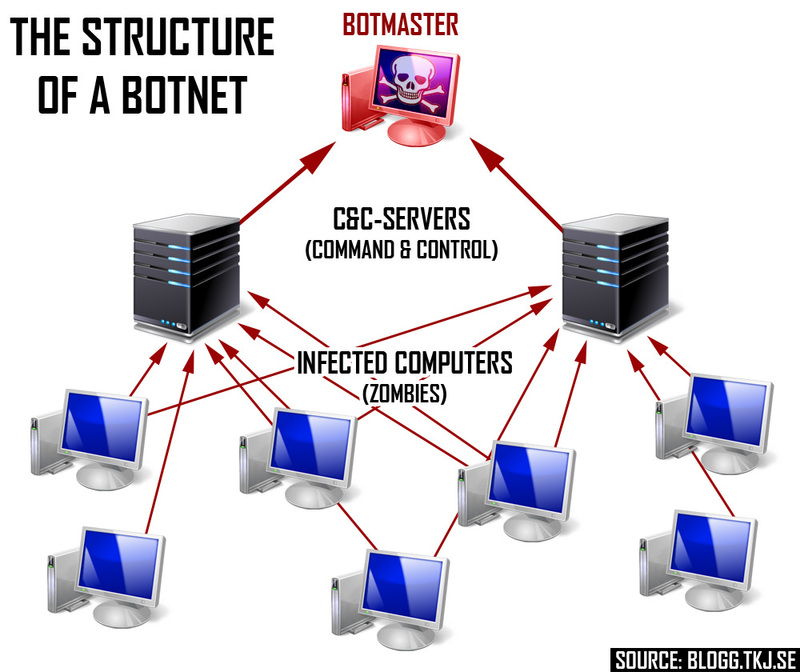 This situation has led many organizations to opt for fast and effective techniques that are illegal and that are known as Black Hat Seo. Although the immediate results achieved in the beginning may seem like a solution, they are just the opposite. If you fall into that trap, you must prepare yourself to suffer penalties from Google. 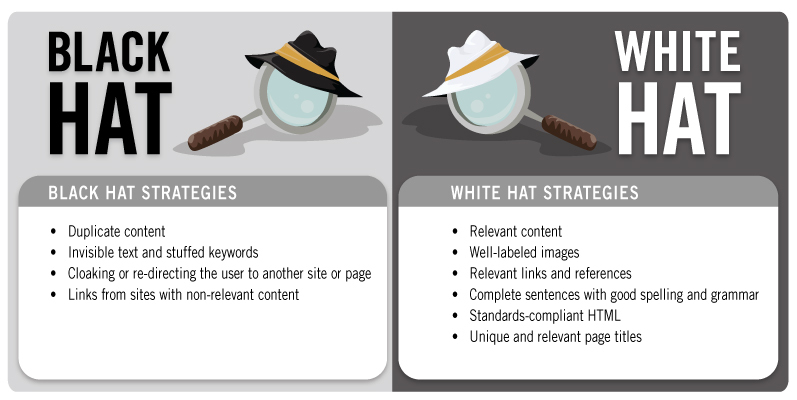 What are Black Hat SEO disciplines? These techniques will only take you to the dark side with no way out. They are a set of unethical practices to achieve instant results. The objective is simply to improve the position in the Google ranking within the results pages (SERPs) for specific keywords. If you apply the opposite techniques, White Hat SEO, you will get the same results but it will take a longer period of time and you will be respecting the rules imposed by Google. Organizations look for immediate answers. However, not respecting the limits imposed by the search engine in order to display a page in the SERP can have disastrous consequences. 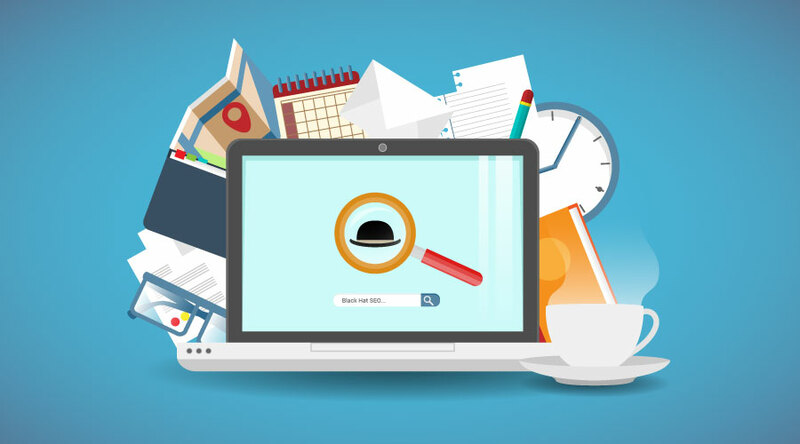 Black Hat SEO is effective in the short term, but as soon as Google detects that you have cheated, you should prepare yourself for the worst. 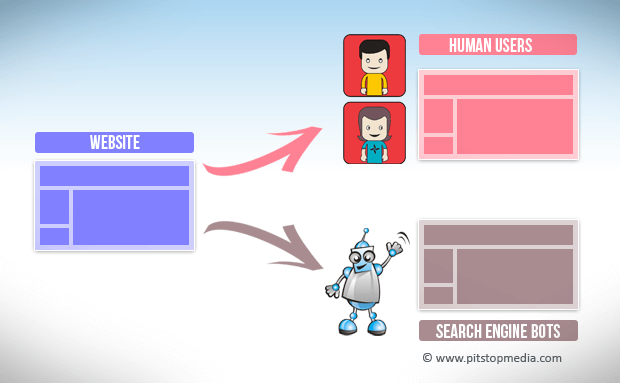 It will not only lower your site’s positioning, but your site may end up disappearing from the results page. It is a trap technique since what the search engine sees is not the same the users see. It consists on deceiving Google, making it believe your page is optimized, when in fact it is not. Users are directed to a page that has not been located by the search engine. An example of this are the so-called flash pages. That is, pages where the contents differ based on whether they are seen by a robot or a user. Due to the increased use of this practice in recent years, Google is very attentive to everything that happens, and if it identifies your site, you should know what awaits you. The search engine has the techniques and tools to detect this practice with a simple click. Therefore, you must be very careful. The ideal thing is to forget about this technique. You must understand this concept in order to understand what Black Hat SEO is. It is an unethical, simple and very popular practice. Keyword stuffing essentially consists of repeatedly using a single word. If you do it a couple of times, nothing will happen. The problem is in the excesses. Google is clear on this issue of keywords and SEO positioning. 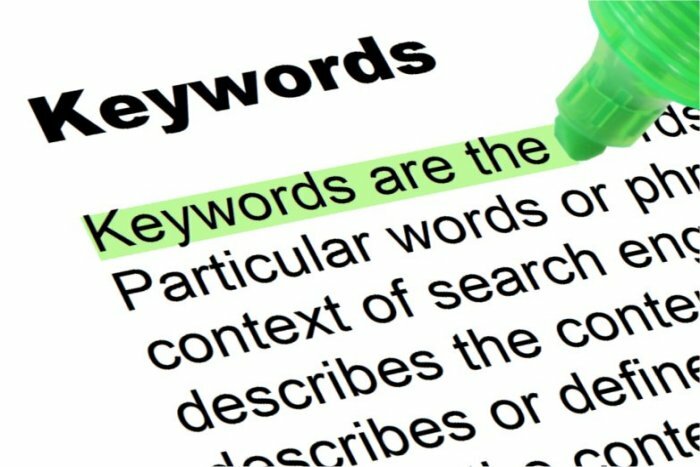 It is possible to use the keyword, as long as it responds to the needs of the users and offers value. The use of nonsense keywords that only confuse the user is severely penalized by the search engine. It is essential to remember that contents must be of quality and relevant to the person reading them. It is about making the user feel comfortable when he decides to read one of your texts. There is no correct percentage of words. You should just think what is most natural for easy reading. It is another technique you should know to better understand Black Hat SEO. It is the practice with which you will have less chance of being penalized by Google, but it is also not recommended. It consists of creating new articles based on original ones. This means that, even though you will not copy the article in its entirety, you will be imitating a text that already exists. And Google does not like that either. This practice is based on the idea of ​​reusing texts by changing words or the order of sentences. These modifications help you generate content quickly and easily. It is also deceptive for the user, as it makes him believe it is new content. There is software that allows you to automate this process, making it easier to modify words. But it is also possible to do it manually, more natural and credible for the reader. The first option is heavily penalized by Google. It was with Google Penguin that this practice began to be sanctioned. Its effectiveness is so great, that it detects this practice more quickly and more frequently every time. You already know what Black Hat SEO is, and the previous are some of the most used techniques but there are many more. If you detect your competition using these bad practices, it can help you positioning your company better in the ranking and appear higher in the results pages or SERP. As a result, there is a trend where not only Google works in SEO to detect these bad practices, but also the brands participate. There are many tools that allow you to report it if you identify the use of Black Hat SEO and you notice fraudulent pages. If you decide to use an external agency to analyze your company’s SEO, you should pay attention to all the details, from the presentation to the website functioning. If you notice phrases that promise too much and call your attention, you should be cautious. It is possible they are selling you results achieved with Black Hat SEO techniques without you realizing it. Faced with this situation, it is essential to locate these bad practices. Otherwise, there are great chances of being penalized by Google. There are tricks you can use to avoid this. Performing an in depth SEO analysis will help you avoid major problems. One of the most common practices is the use of hidden text. Discovering this kind of texts is more complex than you may think. However, there are elements you can check that they will help you visualize it. This kind of pages use text in the same colors as the background, so detecting it is very complicated. As for the fonts, they are usually small, making them barely noticeable. The main trick is to show this text in an area that users do not visualize, for it to go unnoticed before their eyes. Besides these methods, it is possible to use other more technical methods. One of them is the analysis of the website’s source code. Also, you can copy and paste the phrase you want in a word processor and by increasing the font’s size, you can check for hidden text. It is another of the most common traps. You should know this technique to understand what Black Hat SEO is. Re-routings occur continuously. You visit a website, click on a section and it redirects you to a different page within the same domain. This practice is not negative as long as the contents are related. If you access a website on one topic and the page you are redirect to one covering another subject, it is likely to be deceptive page. You will also notice that its domain changes. However, if you have doubts, it is best to use quality tools such as Whois. This app allows you to obtain more information about the domains. You can check whether they are actually registered or not. Otherwise, you might have encountered a deceptive Black Hat SEO practice. Like many other products, domains expire. If they are not renewed, you may encounter serious problems. Companies must be especially careful and pay close attention to their domains’ expiration date. Failure to pay the renewal fee will make your website expire and disappear. Spammers will try to take advantage of the situation to place as much advertising as they can. Another practice is purchasing similar domains, so that if a person gets confused when writing, he will fall into the trap and appear on their pages. If you detect that you are redirected to a site full of ads or that the contents and domains do not match, you should become suspicious. These are pages with content that is self-generated by popular Internet robots or bots. If you want to optimize your page and achieve good SEO, you should pay attention to this issue. These contents are not created by human beings, but by robots. It is a profitable business with which it is possible to generate large profits in exchange for clicks on ads. A good way to detect this practice is by clicking on the text’s keywords. You will notice there are no changes of any kind or that the page includes a great number of ads. It is important to understand what Black Hat SEO is because this will help you avoid being penalized by Google. But even more important, you will be offering valuable content to your users, making them have a good experience when they visit your website. Coobis is a content marketing platform that can help you understand what Black Hat SEO is and the dangers it poses to your company by analyzing the more than 10,000 digital media that are part of the directory. At Coobis, advertisers and publishers are united with the sole purpose of creating original and legal content. Getting positioned in Google is easy if you do it with Coobis.